Early Light is one of the world largest toy manufacturers, and a member of the International Council of Toy Industries (ICTI) CARE process. It is a long-time producer for big brands including Disney, Mattel and Hasbro. Its president, Francis Choi Chee-ming, is known as the “King of Toys”. Its factories in Shenzhen and Shaoguan have a capacity of up to 70,000 workers. Yet such a renowned enterprise has surprisingly appalling OSH practice. Since 2011 several cases of chronic benzene poisoning have come to light at Early Light’s Shenzhen plant, which has a workforce of over 3000. The case has only been exposed thanks to the persistence of six of the affected workers. Their experience revealed how the factory has been systematically covering up the problem of benzene poisoning, showing a serious disregard for the rights and health of the affected workers. In accordance with the law, Early Light has been conducting annual health check for its workers. However the results are not disclosed to the workers; rather the information thus obtained was utlised by the factory to quietly weed out sick workers. In early 2011 after the usual annual body check, Luo Yuanxiang and about 100 other workers were requested to undergo repeated examinations. They then received a notice that they are to be transferred to various different departments where they have no expertise. Luo and a few workers protested about the transfer, but most other workers complied. Suspicious of the factory’s motive, Luo and her friends demanded to look at the examination reports. The factory refused. The group decided to take the matter to the local authorities. After much protests and haggling, the local occupational diagnosis institution finally agreed to give them further examination and concluded that they are suffering from chronic benzene poisoning. 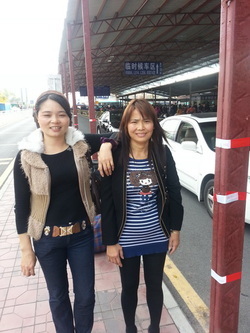 Luo and her friends used to work in the spray painting department, and were in daily contact with thinner and paint. They have worked in Early Light for about 8 to 12 years. With the help of an NGO, the workers have been involved in a four way negotiation with Early Light, ICTI and Disney in order to find a satisfactory solution to the issue. During the negotiation Early Light disclosed that in the annual body check of 2012 a further group of over 100 workers were found to have suspected symptoms of benzene poisoning. When pressed about whether the workers have been given the health check results, the factory maintained that it is necessary to withhold the results in order to prevent the spread of “unwarranted” panic and disturbance. The factory refused to divulge further information and merely assured us that all suspected cases have been properly dealt with. To date three of the six workers with confirmed diagnosis have received private settlements.